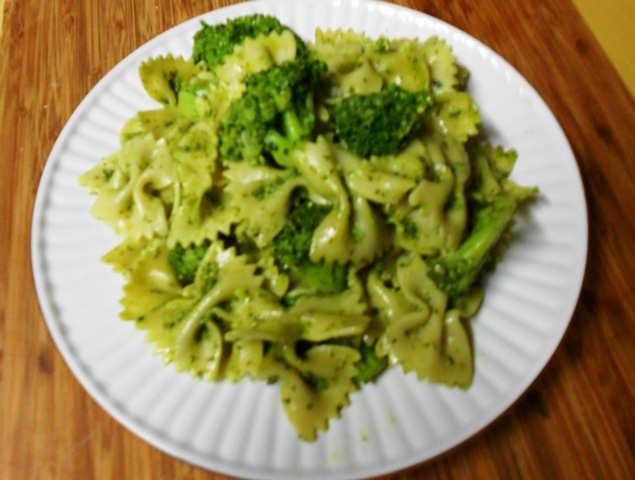 Farfalle pasta with broccoli and cilantro pesto. Gardeners who plant cilantro know something about self-sowing. Cilantro is one of those plants that likes cool weather; early spring or fall. If you try planting it when the heat of summer is on, you will be disappointed with leggy plants that never develop the large, healthy, bright green, robust leaves that you see in the markets. It goes to seed rapidly and the plant becomes so spindly that it’s very easy to miss when weeding. The advantage to this is that, in its seeming invisibility, while you’re dashing around the garden and kitchen trying to deal with the zucchini, green beans, radishes, lettuces, etc…, the cilantro is busy casting it’s seeds about. When the cool temperatures start settling in, so too do the cilantro seeds. Right now, the garden is replete with robust cilantro plants, and though I long to find a recipe for that wonderful, slightly acidic, slightly sweet, green sauce, cilantro condiment that is served in every Indian restaurant that I’ve ever patronized, (this would, of course, be a ‘canning’ recipe, which seems to be very hard to come by on the web), I’ve yet to find one. This evening, in an attempt to forestall Andrew’s complaints about the cilantro plants ‘that you (I) never do anything with” I did a websearch and came upon a Cilantro Pesto Recipe. After reviewing several comments and suggestions for alterations, I got the drift and whipped up a giant batch in the cuisinart. I blended it with farfalle pasta and steamed broccoli florets and it was exceptionally delicious. It would be great served with shrimp, adding, perhaps some more lemon or lime juice and a few gratings of rind, and it would make a very nice, quick canape spread on bruschetta. ( I was just eating spoonfuls of it straight from the cuisinart, but this, though tasty and indulgent, is not, perhaps, the most elegant serving suggestion). Better yet, unlike basil pesto, its retains its bright green color. I’m so enamored of this Eureka recipe that I’m going to freeze a few batches and remind myself of this season in mid-winter! ← Garden Chores to do now. Hmmm, thanks for that. You can buy huge bunches in the market right now, so I will go off and avail myself of some with your recipe in mind.